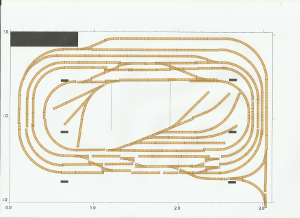 The plan of the new layout, now with a couple of diamond crossings. Major changes to track. Diamond crossings added. Whole layout lifted and now mounted on polystyrene insulation boards. Trains are a bit quieter and run more efficiently as track is a lot more even. Still havimg problems with points motors, it appears to be the motors themselves not the Pi controls or relays. Scroll down for a map of the layout. The aim is to use a Raspberry Pi to control points motors around a train layout. The Old layout is simply two loops, inner and outer, with a siding. Four switches will be used to select options. Direction of travel is clockwise therefore trains will reverse into the siding to swap carriages. To prevent collisions, when shunt is selected siding point will open and the points controllling the outer to inner changeover will operate to switch any other trains to the inner track. Switch one reset - set all points to closed. Two other options will be available, inner to outer and outer to inner. Since point motors operate on 12v and the Raspberry Pi only manages 3.3 or 5v I will use relays to operate the motors. After several attempts, it works. Initially I tried putting the whole circuit on a bit of stripboard but must have made some errors in cutting tracks etc because it was not working properly. I then added a CDU – but this didn't help. I then tried a better PSU, and yippee it worked. I have now built the circuit on some breadboards and whilst it is working I am going to leave it as is. The power supply is a 12V 5A General purpose PSU. Modifications to above before being dismantled in December 2014 to build the New layout. Switch one was changed to simply close the outer to inner points. If the inner to outer were also operated, any train running over them was derailed. The CDU was re instated, wired up properly it worked, and reducing the number of points switching at the same time helped. The power supply is now the basic transformer supplied with an analogue train set. Much improved. See pictures. Built on a thicker baseboard and designed using XTrackCAD. My thanks to the creators of this software. Track now laid and dead spots sorted. The wye is wired up. The first set of points are "dead" but the other two sets are live. There is a switch to supply power to the isolated section, on the curve on the way out. When loco leave isolated section, first point are switched and loco continues. Starting to position and connect up points motors. Got points motors wired up and basic control program written. Got it all wired up and working, just about. The wye works, almost. There is a switch under the decoupler but only one loco is heavy enough to trip it. Patforms 1 and 2 points are on a timer, need to tweak this so train gets out before points reset! Euan has been drawing pictures for the background and Daddy has been making cardboard freight containers. Pottered about with the layout and bought a new loco. The orange and black LoadHaul one. Successfully fitted a decoder and it runs fine, excellent slow speed response. Also went to model railway exhibition at Perth Dewars Centre, very good. Got a few more points motors and other odds and ends. Spent more time than expected on the layout, due to the lousy weather. A few more subtle changes and tweaks. Time for a new layout. Euan has seen a Diamond crossing amd wants one on the layout. Daddy trawled eBay and bought four, for a fiver. Diamond Layout. Having decided to redo the layout I also decided to sort out the unevenness of the track. The really new Diamond layout is now on polystyrene insulation blocks. A light coating of grey primer covers the joins and hopefully allows for landscaping later. The points control is also developing with a crude control via a Nexus 7 touchscreen tablet. The announcement of a dedicated touchscreen specifically for the Raspberry Pi is good news. A request for one has gone to Santa!